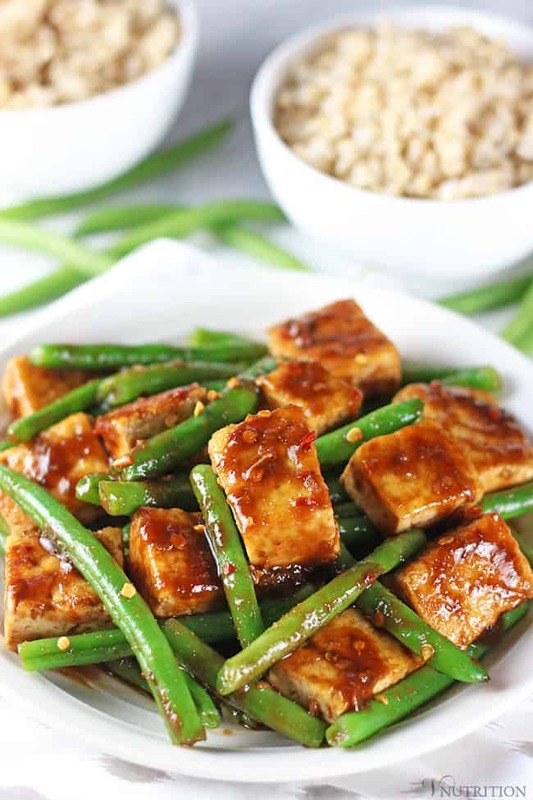 This simple Tofu Green Bean Stir Fry is easy to make, healthy, and delicious. It’s vegan, gluten-free, and doesn’t contain MSG like you’d get from many local takeout places. Have the takeout without the guilt! I know you probably know the feeling of being so tired after a hard day that all you want to do is sit on the couch, watch a little indulgent TV, and order some takeout. I’ve been there, done it (more than I like to admit). The problem is, after eating some of that takeout, I feel overly full and kind of gross with all the additives and extra sodium that is usually found in there. Ever feel like that too? 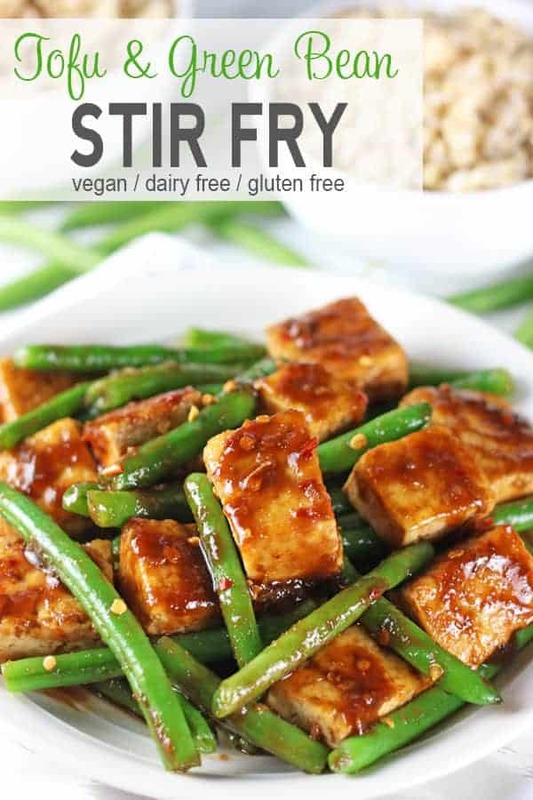 If you know what I’m talking about, I’ve got the perfect dish for you today – my Simple Tofu Green Bean Stir Fry. The problem with takeout is that I’m never really sure what’s in the sauce or the type and amount of oil they use. When making a homemade version of one of my favorite takeout dishes, I can control exactly what I put in my sauce and how much oil I use. Brown sauces from Chinese restaurants can contain sugar, MSG, lots of salt, beef/chicken broth, etc. I’m not down with all that stuff so I like to make my own using simple ingredients from my kitchen. 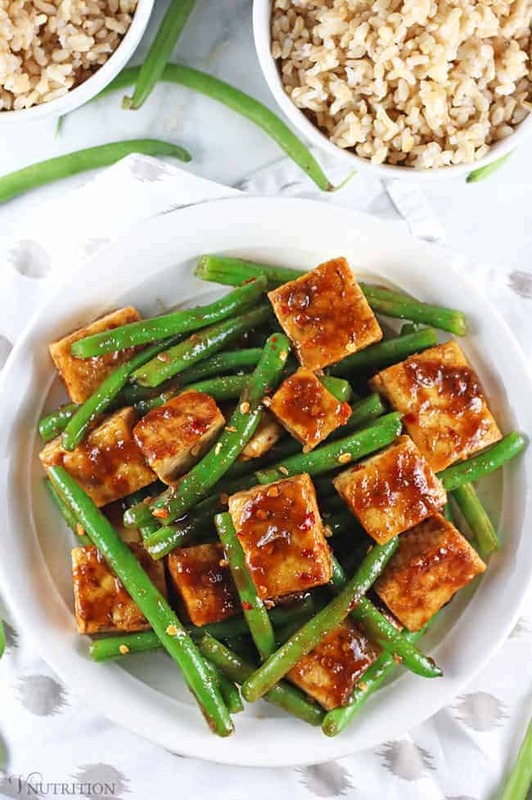 I do use some oil to fry up the tofu which I know some people might not be down with and I get it, I used to feel the same way – that oil was the enemy. I’m using only 1 TB of a healthy oil, and to me, that isn’t a problem. I get the crispiness and tastiness of frying without too many extra calories plus the heart-healthy benefits of extra virgin olive oil. 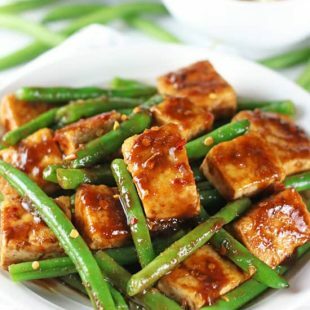 I chose string beans because my local Chinese restaurant has a tasty dish I sometimes get with tofu and green beans. Now I can have takeout without feeling guilty. 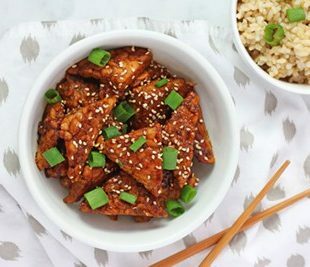 If Chinese inspired tofu isn’t your thing, check out my Popcorn Tofu or my Tofu Feta – both are totally tasty as well! I hope you love this recipe as much as I do. If you try it, please come back and leave me a comment below with your feedback and star rating. Meanwhile, add oil in a nonstick pan over medium heat and cook tofu for 5 minutes. Mix sauce ingredients in a bowl until smooth. 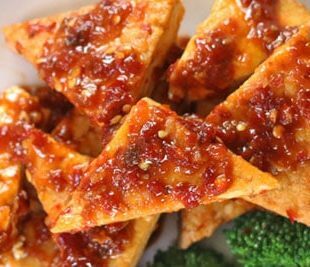 Flip tofu and cook for another 3-5 minutes until crispy. 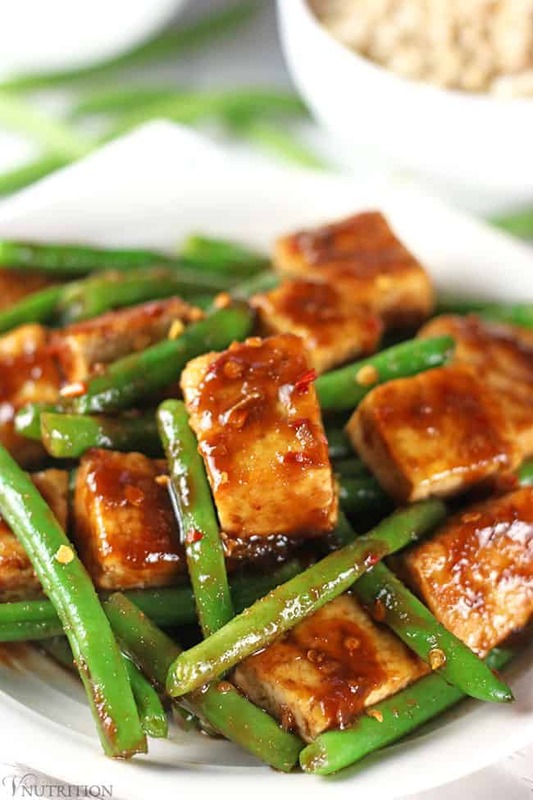 Add sauce to the tofu and stir continuously until it is thickened. Turn off heat, add cooked green beans, and stir until incorporated. Serve with some brown rice and enjoy! Feel free to boil green beans if you do not have a steamer. This looks delicious and far more nutritious than take out! Johanna, to get them to stay green I steam them but leave a little “bite” to them. I think once they get a little to “done” is when I have the darker green beans. Pinned for when my CSA gets more Green Beans than I know what to do with! I need to get into a CSA! They sound so fun! This looks so good! I think we’ll make it later this week. I love the green beans that are in season right now! 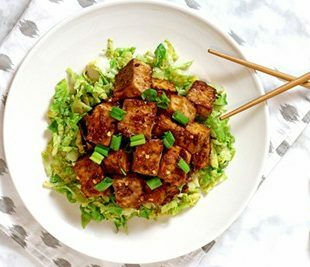 It’s a good way to mix up our regular routine of tofu + rice + frozen broccoli! 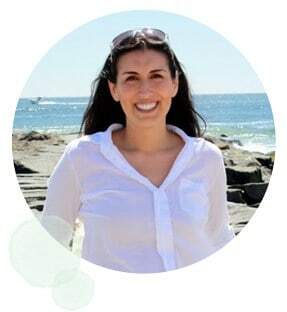 Thanks so much Sarah! I hope you enjoy! I adore simple stir fries and this one looks perfect. Thanks! I made this tonight and it was pretty tasty, and very easy to get on the table. I did double the sauce, but thought the soy sauce was too much to begin with so only used 4 Tablespoons. I also used unsalted chicken broth. It was salty enough for me. Make sure you taste it before doubling the red pepper flakes too, a little goes a long way. And finally, I added a few chunks fresh pineapple and served it over unseasoned ramen noodles. From start to finish, it only took about twenty minutes to prepare. I will be using this again, it is a nice, healthy, easy recipe . What a great idea to serve it with ramen noodles. I’ll have to try that soon! Thanks Kimmy! So glad you liked it! How would you recommend reheating this? I’ve made it in the past and it is SO GOOD that I want to make it for a potluck tonight, any recommendations for reheating? Thanks! 1. If you have an stove top available to reheat, that would probably be the best way to reheat. Just stir a little extra veggie broth in so things don’t stick too much. 2. If you have an oven available to reheat, that would probably be the second best way to reheat. You could have it kind of hot when you bring it to the potluck and then throw it in the oven to keep it warm. (I haven’t done this before but I would think it should be okay and keep the tofu more crispy than a microwave). 2. I’ve microwaved the leftovers at work. It was still tasty but the microwave kind of makes things a bit “limpy” so while the flavor was there it wasn’t as crispy. If all you have is a microwave it wouldn’t be the worst thing in the world since the flavor will still be there. 3. I’d probably make a little extra sauce on the side to bring in case you need it no matter what way you’re reheating. Sometimes when reheating it’s not as “saucy”. Let me know how it goes! I hope everyone enjoys!